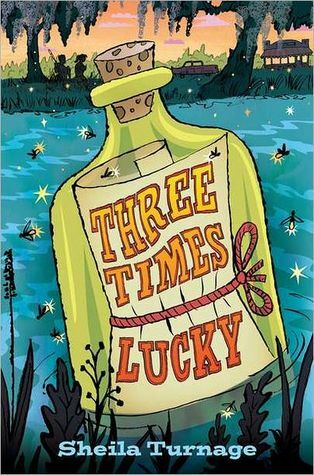 Three Times Lucky by Sheila Turnage. Grades 4-7. Dial, 2012. 312 pages. Review copy provided by my local library. Rising sixth grader Mo LoBeau is looking forward to a nice, relaxing summer: fishing with her best friend Dale, setting bottled messages afloat on the North Carolina creeks in hope of finding her long-lost birth mother, and hanging around Dale's older brother Lavender as much as possible (she is, after all, going to marry him someday). But when Detective Joe Starr shows up in their tiny town of Tupelo Landing, Mo knows that there's trouble brewing. When miserly recluse Mr. Jesse is found dead, Mo knows she has to take up the case herself and soon it's hitting all too close to home. You'd be hard-pressed to find someone who can resist the spirited Mo LoBeau's charms. She's a spunky narrator, tough as nails and brave as they come. She always has to be the center of attention, whether it's running her adoptive parents' cafe (serving up PB& J with a bottle of Mountain Dew cooling in the back) or investigating a murder. I also got caught up in the language of this book. It's smart and funny, each word carefully chosen to great effect. Sheila Turnage's descriptions of Tupelo Landing and the kooky characters who live there bring the setting to life. I'm not a huge mystery fan and the plot dragged a little bit occasionally, but that could have more to do with my personal taste than any errors in pacing. Check out more reviews at Book Nut, A Fuse #8 Production, and Welcome to My Tweendom. And hey, this book won a 2013 Newbery Honor! Hooray! For kids who like the writing style, I would try Savvy and Scumble by Ingrid Law. For kids who like the writing style or the spunky orphan searching for her birth mother, I'd hand them Keeper by Kathi Appelt, another book set in a quirky town in the South. I read this book for my staff genre reading program! We're Reading Wildly in 2013 (and beyond) to improve our readers' advisory.